For students in general category– 105 out of 360, (down from last year’s 115). And, for SC and ST– 50 and 44 respectively. The highest scorer of JEE main 2015 result is Sankalp Gaur from Pune, who scored 345 out of 360, and 2nd Topper is Pranay Agarwal from Jaipur scored 341 out 360. However, for admission to colleges other than IIT’s, (including NIT’s or Deemed Universities, etc), CBSE will release the ranks separately, on the basis of 60% of JEE (Main) score and 40% of Class 12 board marks.Separate rank lists will be prepared for admission to BE/B.Tech and B.Arch. The top 1.5 lakh candidates will be eligible to appear for the JEE Advanced for admissions to IITs. The successful candidates will be eligible to register online from 2nd may to 7th May 2015. The detailed information to fill the application forms for JEE Advanced exam can be viewed on the JEE Advanced website. 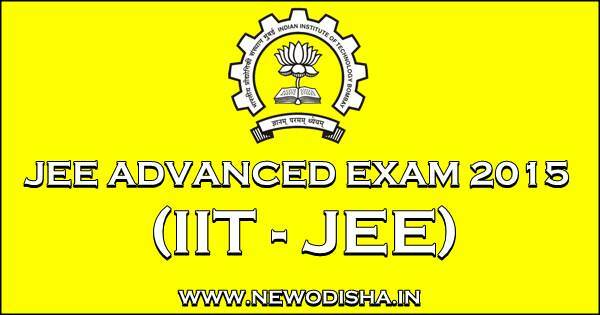 The JEE Advanced exam on 24 May, 2015 with two papers are scheduled for the candidates.The students who clear the JEE Advanced, will get admission to the Indian Institutes of Technology (IIT’s) and Indian School of Mines (ISM). 1. Only candidates declared eligible for JEE (Advanced) 2015 can register. To view the JEE (Main)-2015 Paper-1 score, click here. 2. Furnish information carefully in the online registration form after reading instructions and Information Brochure of JEE (Advanced) 2015 carefully. You will not be able to change any of the entries after final submission. 4. Do not send any hard copy to your Zonal IIT. Preserve them for future use. 5. Keep the same mobile number as provided during registration operational till the end of all processes for JEE (Advanced) 2015 and ensure that your mobile phone is not kept on DND (Do Not Disturb) mode so as to receive SMS on matters related to JEE (Advanced) 2015. Candidates should login using Roll Number of JEE (Main) , Password created during JEE (Main) registration and security pin. If the candidate furnishes this information successfully, then system will prompt for change of password. Once registration is done, the page containing the JEE (Main) score and all personal, academic and contact details as furnished to JEE (Main) will be displayed. The candidates are required to furnish additional information for JEE (Advanced) like Choice of examination centres, Language of Question Paper, eligibility for DS category and Class XII (or equivalent) examination Board’s Roll No. The candidates are required to upload the photograph, signature, thumb impression and scanned certificates of Class X / DOB proof, Class XII (or equivalent) examination, Category, PwD,Scribe Request Letter and DS certificate as applicable in JPG/JPEG format. Size of the Photograph image must be greater than 10 KB and less than 100 KB. Size of the Signature, Thumb impression image must be greater than 5 KB and less than 30 KB. Size of the certificate image must be greater than 50 KB and less than 300 KB. Payment by Debit Card / Credit Card / Internet Banking: The candidate has to click “Pay Registration Fee”, then the system will automatically redirect to State Bank Multi Option Payment System (MOPS) page. As per the candidates’ convenience, they may select any of the available options like Debit Card/ Credit Card/ Internet Banking. After successful payment, candidate will be able to print the “Registration Details” with UNIQUE Registration Number. Payment by CASH using SBI Branch Option:The candidate has to click “Pay Registration Fee”, then system will automatically redirect to State Bank Multi Option Payment System (MOPS) page. In case of Cash payment candidate has to select “SBI Branch” and system will generate the challan. The candidate has to take a printout of the system generated challan and take it to the SBI branch for making cash payment. After payment, candidates are required to visit this webpage again and download the “Registration Details” with UNIQUE Registration Number. Payment for DUBAI Exam Centre:Those candidates who want to select the DUBAI as the examination city are required to pay the registration fee of an amount of US $ 220 through International Debit/Credit Card issued by Foreign Banks and issued outside India. Payment in US$ is not allowed through Debit/Credit Cards issued in India. After successful payment, candidate will be able to print the “Registration Details” with UNIQUE Registration Number. Candidate is advised not to disclose or share their password with anybody. Neither IIT Bombay nor NIC will be responsible for violation or misuse of the password of a candidate. Candidates can change their password after login, if desired. Using Security Question & its Answer you chosen during Registration Form filling . Give Responses for "Online Registration For JEE Advanced 2015"